(The report for Day 1, last Thursday, is here.) 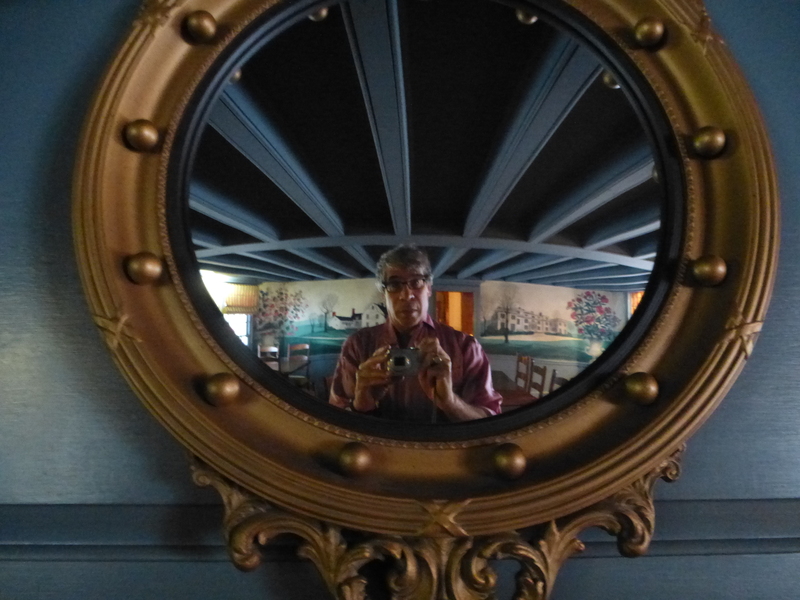 I went to four discussions/talks on Friday, August 17, and then repaired back to my B&B, the Old Drovers Inn, to rest, work a bit, and have dinner there, as the food is highly reputed. The full schedule for Day 2 is here; I neglected to take photos of the Social Media talk. The University does not endorse “safe spaces” because they also inhibit the free discussion that Zimmer and his predecessors have considered essential to the functioning of a great university. I agreed with everything Zimmer said save one minor point. When asked by Donvan if it was now mostly the Left that tries to shut down speech on campus, Zimmer said that censorship came from both Left and Right. Well, technically that’s correct, but if you look at FIRE’s “disinvitation database,” you’ll see that, over the last four years or so, the bulk of deplatformings, disinvitations, and disruptions of invited speakers in the last five years has come from the Left. Beyond that, I was proud of what Zimmer said, which reflects the free speech principles of my own university. A succeeding talk on “The Social Media Crisis” featured Rana Foroohar, editor and writer for the Financial Times and CNN’s global finance analyst, Roger McNamee, social media expert and investor, and Cal Newport, professor of computer science at Georgetown University. As I didn’t take notes, I can remember just a bit, which included McNamee, who was a big investor in Facebook, indicting those big platforms for manipulation of advertising and adding, in effect, that one should stay off social media. Newport, who wrote a bestselling book, Deep Work, argued the thesis of the book, which was that you don’t need to be on social media to advance your profile or career (although it’s worked for some small businesses), and that you’re wasting your time and professional advancement by frantically perusing social media. I have to say that I’d like to go off the grid for a while and see what happens, but I must maintain this website. But even when I don’t, I spend too much time reading unenlightening stuff, and suspect that if I stopped doing so much Internet Inspection, I’d learn a lot more by reading books. 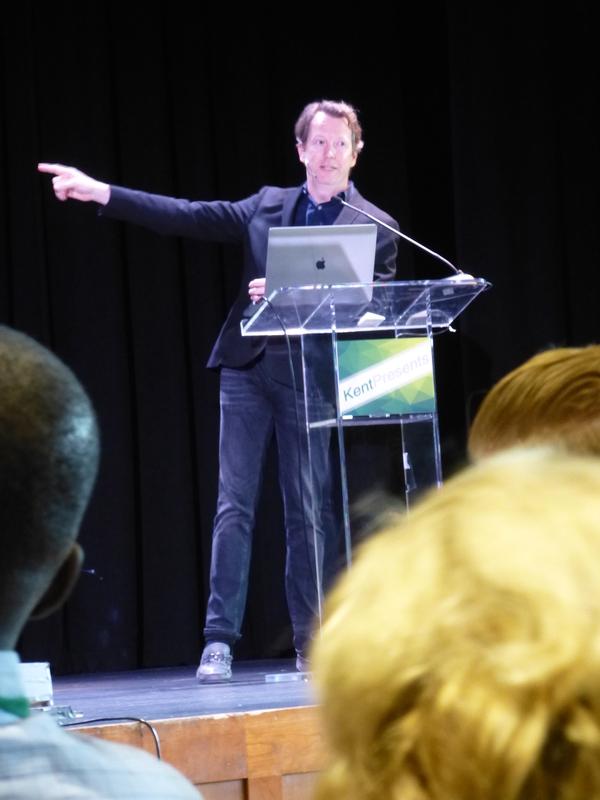 Sean Carroll spoke before lunch on “The Big Picture on Life, Meaning, and the Universe”, a broad topic to be sure. As you’ll know if you’ve heard him, Sean is an enthusiastic and clear speaker, and tried to compress the thesis of his latest book (he’s now writing another) into 35 minutes, which included questions. 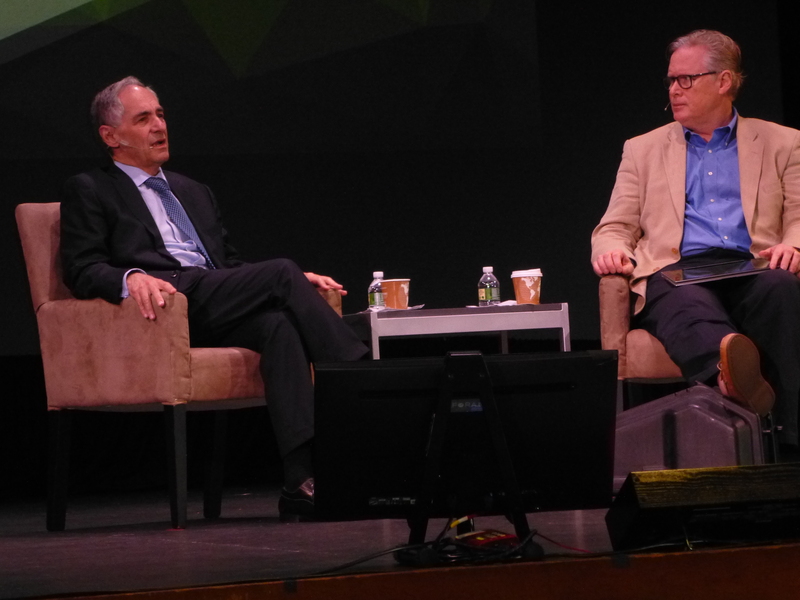 His talk was a distillation of the hourlong talk below given at LogiCal, which I heard live. One of his big points was that we fully understand the basic physics of everyday life, giving the equation presented in the talk below. 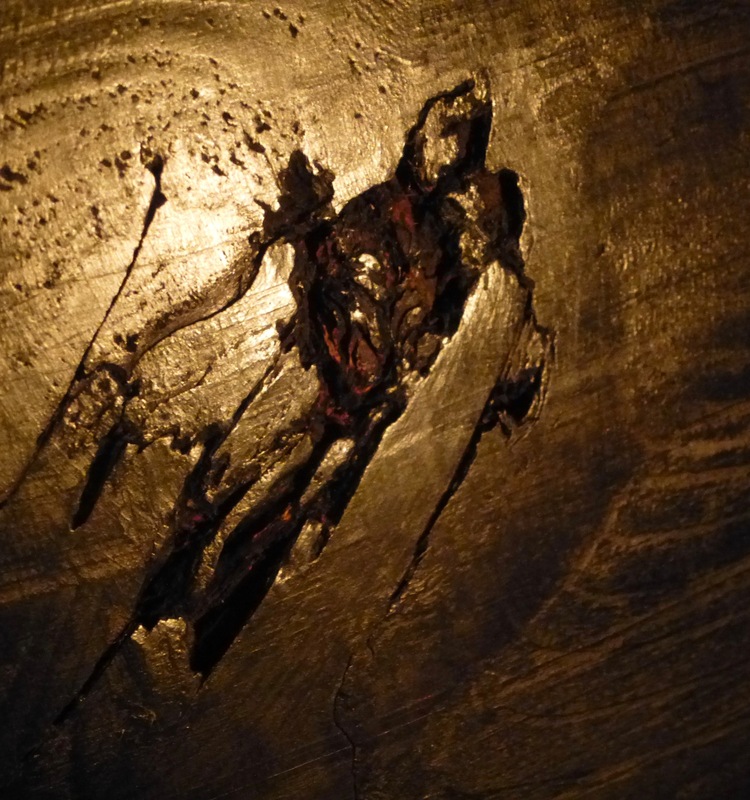 He also said, and I hope the audience got it, that there’s no way that there can be a non-physical soul that can interact with a physical body. Sean, of course, is an atheist, but is less pushy and obnoxious about it than I am. Judging by the applause, the audience really liked Sean’s talk. There does seem to be a dearth of real science at KentPresents compared to politics, technology, and sociology, and I think that in the future they might consider programming more scientists. 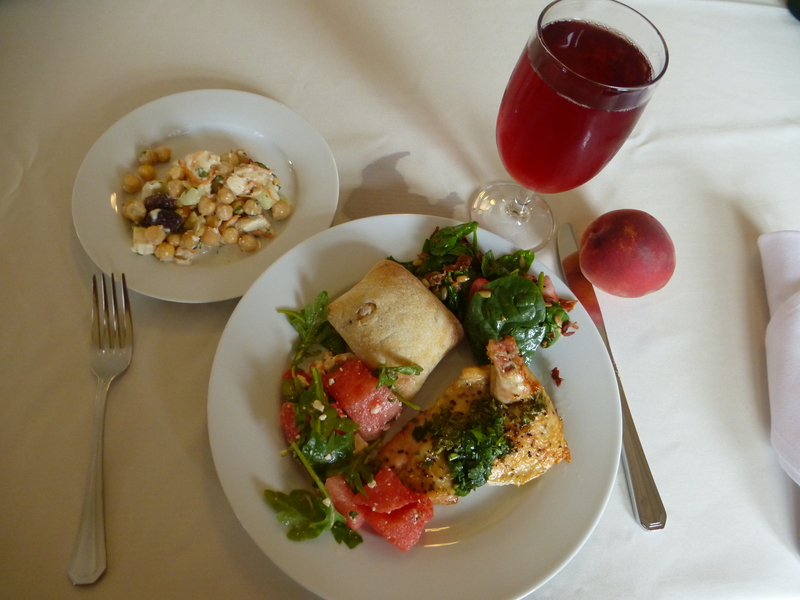 Lunch: herbed chicken with three salads (garbanzo bean, watermelon and arugula, and spinach), raspberry iced tea, and a ripe peach (I’m eating healthier these days). I even eschewed dessert. There was a buffet every day, so you could eat as much as you wanted, but I exercised restraint. One of my gustatory discoveries at the meeting was this wonderful carbonated Italian drink, which is made from the juice of blood oranges. I guzzled as much as I could, but others had also discovered it, so I had to be quick at the bowls of iced drinks. 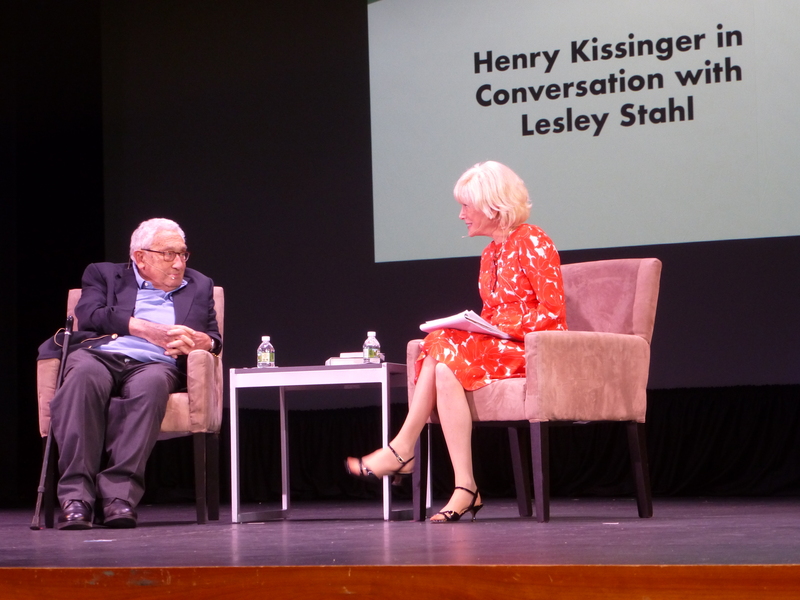 After lunch was the Big Talk of the Day, with CBS news correspondent Lesley Stahl interviewing former Secretary of State and National Security Advisor Henry Kissinger, now 95 years old and running a consulting firm. Many of you will know of Kissinger from having lived during the Nixon and Gerald Ford era or having read Christopher Hitchens’s book about him. 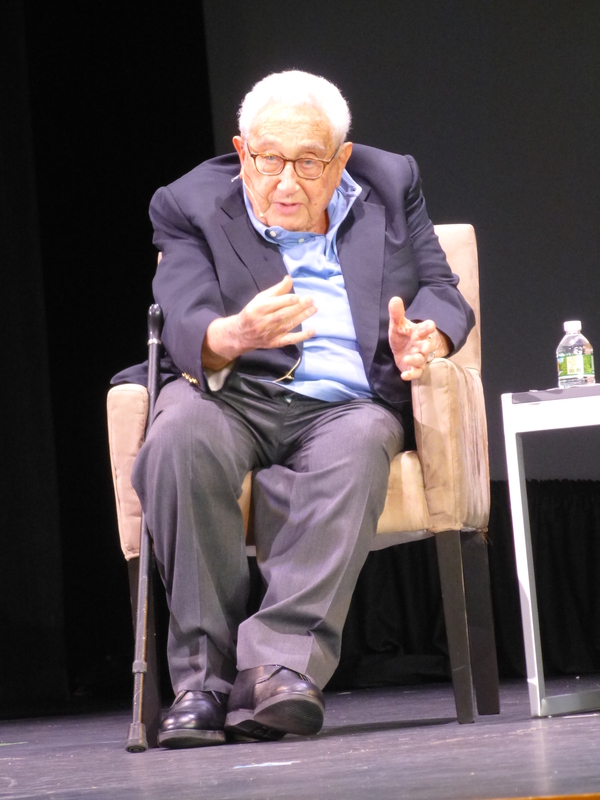 Kissinger lives in Connecticut not far from Kent; at dinner the night before I was introduced to his wife Nancy. Lesley was staying at my Inn, and when we rode back in the limo with her husband the night before, we discussed what she was going to ask Kissinger and how he might respond. It went pretty much according to her predictions. I did have a lot of trouble hearing Kissinger because he has a heavy German accent, his voice has gotten even deeper with age, and my own hearing has always been subpar. 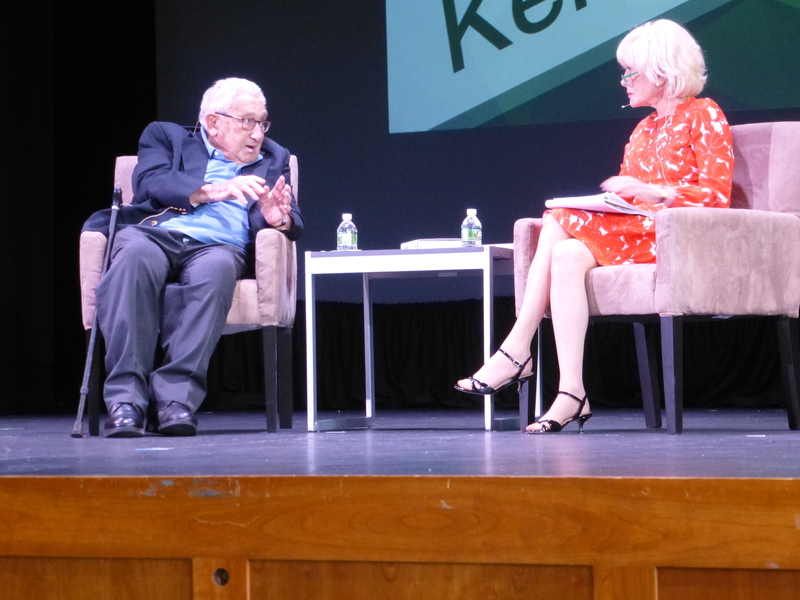 Lesley tried to get him to pronounce on current affairs like the Middle East and Russia, but Kissinger talked a lot about other eras, including his growing up in Nazi Germany and his relationship with Richard Nixon. (He did say that Nixon deeply wanted to change the world, but was hampered because his personality was such that he simply could not abide criticism.) As Stahl had predicted, Kissinger was loath to criticize Donald Trump, and in fact said exactly what she said he would: he would never criticize a President himself (though he did diss Nixon a bit), but only a President’s policies. But about Trump’s policies he had little to say (I might have missed something, and at any rate the videos will be online at KentPresents after a while). When Lesley asked Kissinger if it was a mistake for Trump to have talked to Putin one on one without notes, in effect negotiating with Russia, Kissinger responded (after some pushing) that yes, it was a mistake. One-on-one meetings between leaders, he said, should be largely a venue for the exchange of pleasantries, and the spadework of negotiating should be done in advance not by the President, but by diplomats and professional negotiators. Finally, Kissinger said that he considered the Middle East the biggest international problem facing America, but he had no advice on what we should do about it, simply offering the bromide that we should try to be amiable with each other. But of course he was holding back his real opinions on the issue, which he probably gets paid to tender via his consulting firm. I skipped the other talks that day to repair to my B&B for rest, work, and dinner, missing the fancy dinner at the meeting that night. But I didn’t miss much, because dinner at The Old Drovers Inn was superb. 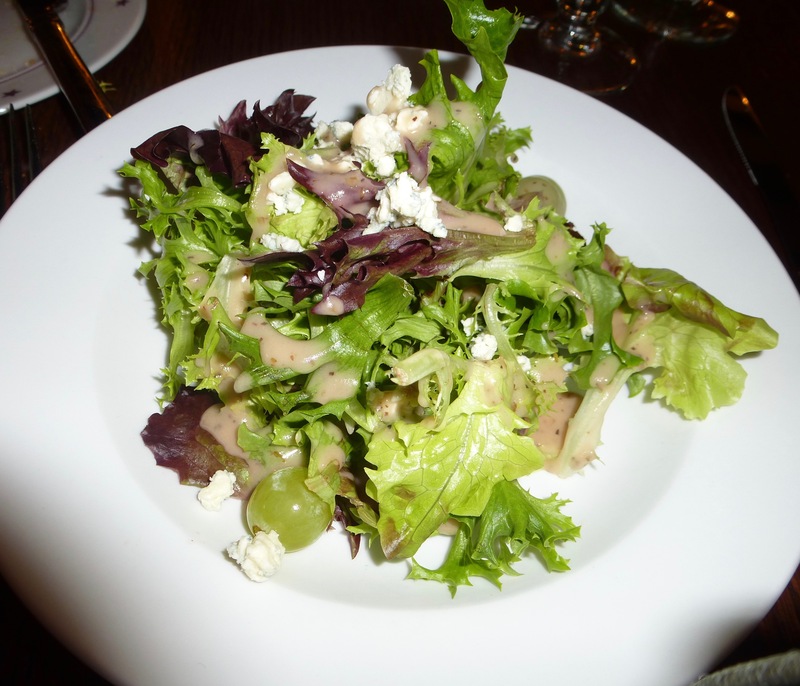 Then a salad with feta cheese. 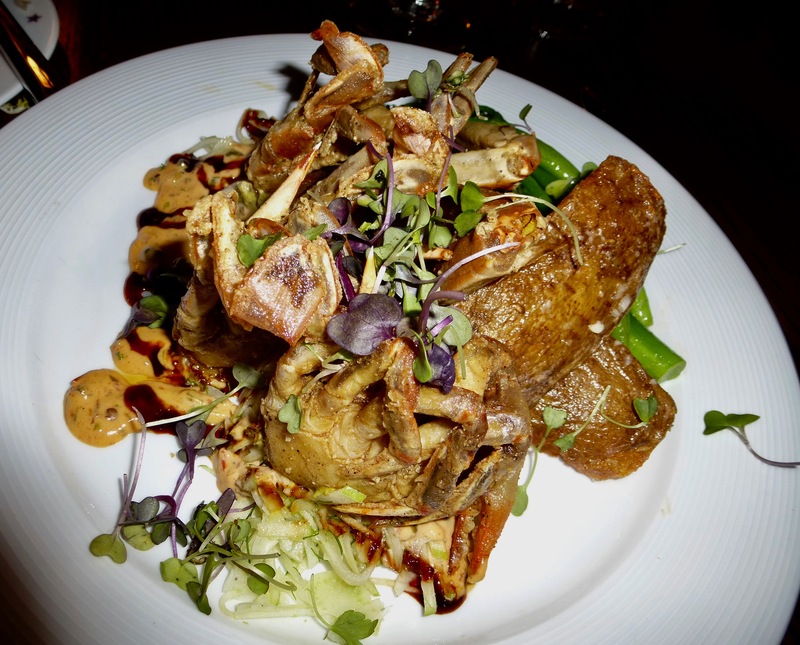 And a wonderful plate of softshell crabs with greens and two huge French fries. I was too full for dessert. This entry was written by whyevolutionistrue and posted on August 23, 2018 at 10:15 am and filed under meetings. Bookmark the permalink. Follow any comments here with the RSS feed for this post. Both comments and trackbacks are currently closed. I don’t understand why H Kissinger continues to be highly regarded, why he is invited to speak, why his thoughts on anything are sought. Exactly right. He should have been locked up long ago. You are wrong ,they don’t do no thinking . 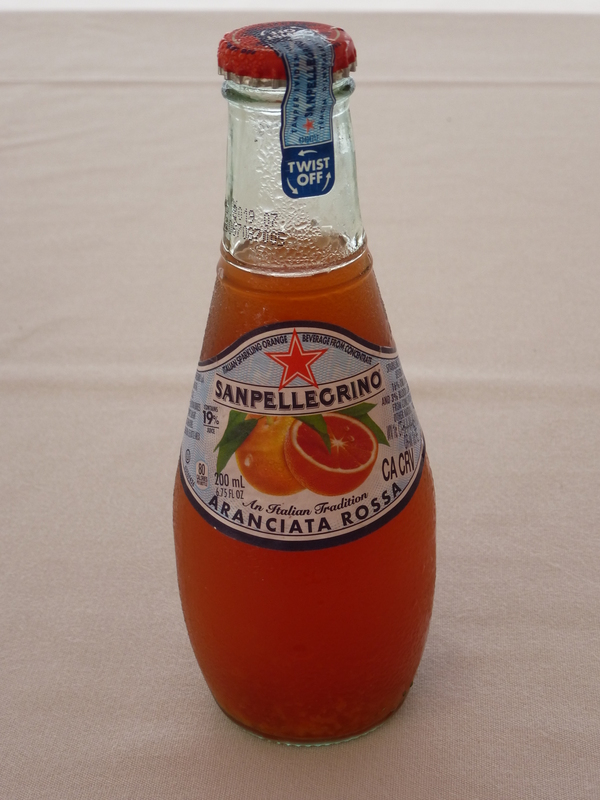 I quite like Aranciata Rossa and other San Pelligrino sodas, but rarely have them. Sugar, you know. Biting my tongue regarding Kissinger. I like them as well, but find them too sweet on their own. A dash coupled with a La Croix or sparkling water does the trick. Out of respect for my hosts who kindly invited me to Kent, and invited Kissinger as well, I don’t want to be harsh on the man in my posts about the conference. I like the San Pelligrino Orange flavor. I pick up a six pack every so often. It makes a nice change of pace. You need to try Chinotto, also from San Pelligrino. It’s based on bitter oranges with a lot of herbal overtones. I think it comes from southern Italy, and maybe Sicily. I’ve found it at World Market and other stores that specialize in imported goods and foods. I think that carbonated drinks (and juices as well) need 1:1 dilution with water. I heartily agree. I brought 3 with me today, donut peaches, and I’m looking forward to them very much. FIRE’s disinvitation database does list more cases of deplatforming “From the Left”. But also keep in mind that FIRE does not address free speech at all universities and it does not report on deplatforming or other free speech failures from all universities. For FIRE, some universities that clearly reject free speech of students are mostly excluded from their reporting scope. Most prominent among these is Liberty University. The clearest statement on this policy that I could find is at https://www.thefire.org/liberty-university-free-speech-and-the-private-university/. It would be interesting to know which other schools FIRE does not include, but they would probably all be considered on the right, rather than the left. Maybe they should be counted as pre-deplatformers. Ol’ Henry the K had nothing if not a keen eye for soft spots at the top of the power structure and a knack for ingratiating himself to the high-and-mighty by playing off their anxieties and showering them fulsome flattery. America’s participation in the Vietnam war could’ve been over in 1968, on better terms than Kissinger negotiated in ’73, if Kissinger and Nixon hadn’t have unlawfully snaked LBJ’s peace deal in Paris in order to ensure Nixon’s 1968 election. There’s a wall in Washington, DC, with the names of an extra 21,041 American kids, and an untold number of dead Southeast Asians, because of their treachery. Not to mention the loss of American standing in the eyes of the rest of the world. Jerry, you’ve never had a San Pellegrino soft drink until now? I would have thought with all the Italian influence in Chicago that they would be routine. Hm! No, this was the first time I’ve had it. This reminds me that fruit-flavored sodas are often more interesting coming from outside the US. I remember when visiting my mother’s hometown of Canterbury, UK they had a wonderful soda called Bing which, of course, was cherry flavored. So good! I see on Amazon it is still around though I’m guessing its recipe has changed for mass marketing reasons. It’s an interesting question as to how one should proportion reading time between reading books and material on the internet. Before the advent of the internet I used to spend about half my time reading books and the rest reading magazines that I subscribed to. Now I don’t subscribe to any paper magazines. Instead, I read magazines from websites as well as certain sites, such as WEIT, that were unavailable prior to the internet. Of course, one must be very selective as to what is read on the internet. There is so much junk. Still, there is a mountain of serious material available that I would other otherwise not be exposed to. It does take a certain amount of effort to reduce to a manageable number the internet articles that I end up reading. Yes, and I am loath to use browser filters because Jerry’s advice to read broadly, at least look at material that is upsetting from time to time. But I look forward to when AI is skilled enough to filter against appetite yet slip through random sprinkling of “otherness”. I’m with PCC on the idea that books will provide much more than the internet. If one reads mostly non-fiction there is much to learn out there. I re-read 1984 last month…much to be gleaned from that fiction. Since moving to the (beautiful) forest, I’ve shifted how I consume much of my entertainment. The internet is less than 256k (yes, really). That means no streaming, no flashy websites, etc. I’ve made great use of the local library, and dusted off the stacks of books I’ve been meaning to read. I think I’ve read over twenty just this summer. Non-fiction takes me longer, but that is alright with me. I’m finding I like the change quite a bit. U of C’s stance on free speech should be the gold standard for every campus in America. Sean, of course, is an atheist, but is less pushy and obnoxious about it than I am. I have never found you to be pushy or obnoxious when discussing atheism on WEIT or Faith vs. Fact. I consider you to be quite civil and polite when it comes to the subject. Maybe you are more strident in public? 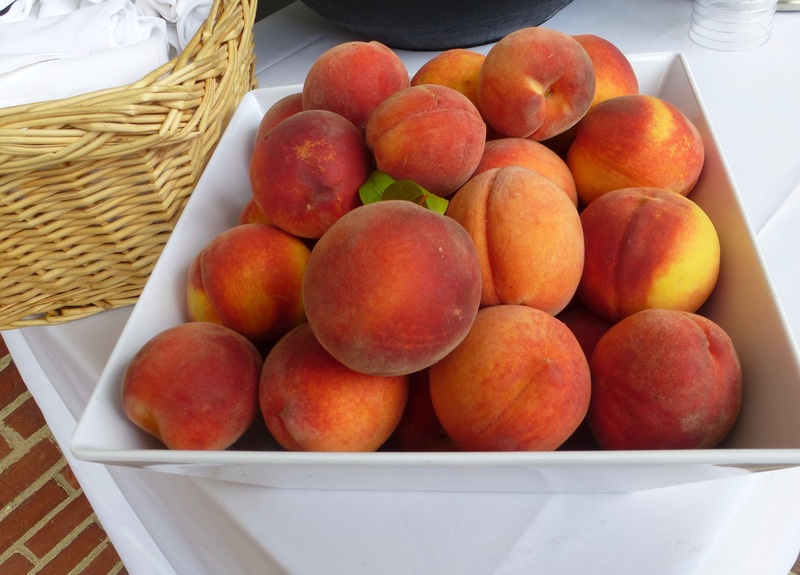 Stone fruits in general are my favorite: peaches, nectarines, cherries, apricots, plums. One of the many joys of Summer, especially when living in a state that grows them. Who couldn’t get behind that? I mean we can say who, but what is the problem with that stance? It doesn’t allow people to be rude or uncivil? My favorite “airplane” joke involves Kissinger. On a plane there are 4 passengers, Richard Nixon, Henry Kissinger, an Irish Catholic priest, and a hippie. The pilot announces that there is engine trouble and after he bails out there are only 3 parachutes! Nixon: I am the President of the United States, so I should live. Kissinger: Vell, I am de smahrtest man in de vorld, so I should live. Irish Catholic priest: Well, me son. I’ve lived a long and fruitful life. I’m preepared to meet my maker. Ye have a long and fruitful life ahead of ye. I think, lad, ye should have the last parachute. Hippie: (after taking a toke) Chill out, no problemo, man. The smartest man in the world just jumped out with my backpack. Nixon, Jimmy Carter, and John F. Kennedy are aboard the Titanic on its fateful first voyage. After the ship hits the iceberg, they come up on the deck and see the crew preparing the lifeboats. I heard that one with JFK being replaced by Gary Hart, and no reference to children. I’ve heard that with various religious leaders replacing the priest and various other “smartest men in the world” – usually at the time I first heard it it was Bill Gates for some reason. Thanks so much for the Sean Carroll talk. His talks are always accessible to non-physicists and very entertaining. 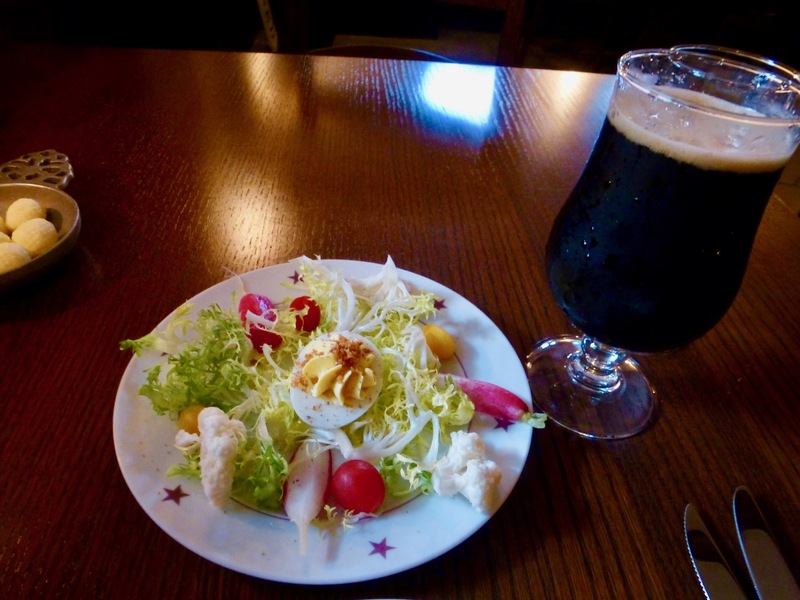 Coyne, food looks wonderful. 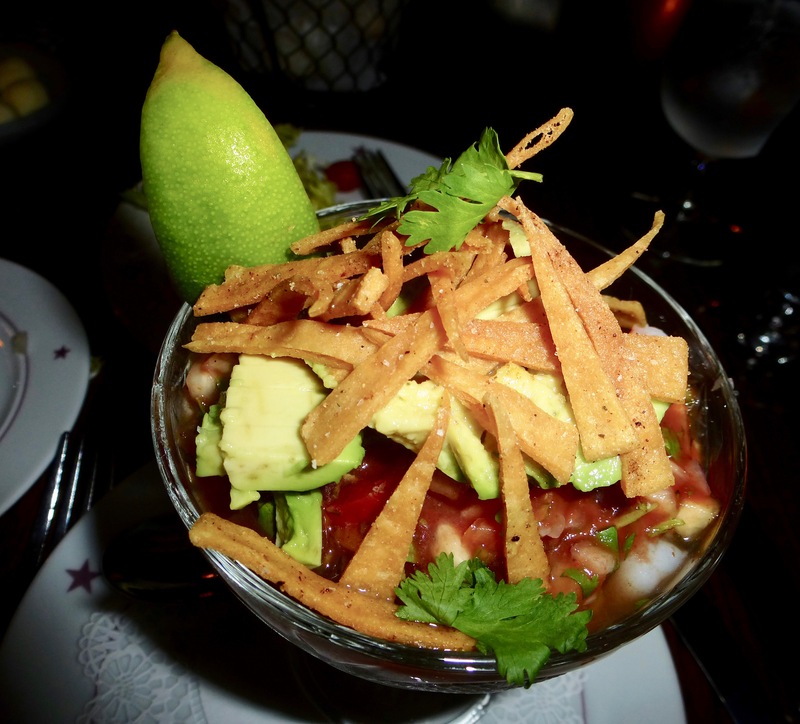 Do attendees and speakers/participants share meals? In other words are the meals you show (other than at b&b) the same for attendees? Yes, the buffets at lunch and the second dinner (which I didn’t attend) are for everyone: speakers and attendees alike. It’s a good way to meet and talk with the people who are there to listen. Sean Carroll’s talk was really wonderful. I finally found time to listen. I know I’m a little late to the party on this, but wanted to make sure to say thank you as it was really understandable for me, not being a physicist.